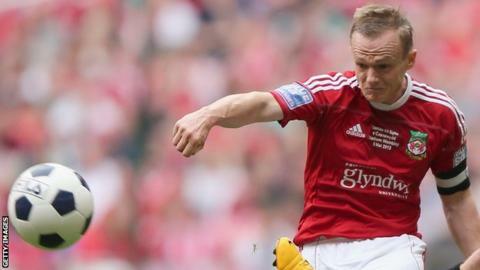 Midfielder Dean Keates says he hopes to prolong his playing career despite his release by Wrexham. Captain Keates, 36, has left Wrexham after nearly five years at the Conference club but says he is not ready to hang up his boots. "I'm still enjoying and I still feel I've got something to offer," he said. "I'll still look at playing but I've had one or two interesting things put to me so far and I'll see what happens." Keates, who joined the Dragons following his release from Wycombe Wanderers in 2010, skippered Wrexham to FA Trophy success in 2013. But Wrexham missed out on a return to the Football League in the same year when they lost to Newport County in the Conference play-off final at Wembley. He scored from the penalty spot as Wrexham beat Telford 2-1 in their final game of the season. Injuries have blighted recent seasons and Keates admits he was not surprised to be released by new manager Gary Mills. "I've loved my time at the football club and had hoped to be part of a team that got back into the Football League," Keates told BBC Radio Wales Sport. "When I first came to the club I knew how big it was. I'd played under two previous players - Darren Ferguson and Kevin Russell - down at Peterborough. "They told me how big the club was and over the last five years it's grown on me massively. "Ultimately the highlight would be the fact I got the chance to lead a team up the steps at Wembley. "But it's come to an end and we part on good ways."